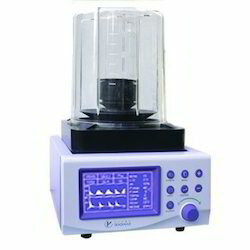 Our Anaesthesia Work Stations are of extremely good quality with best of class pricing. 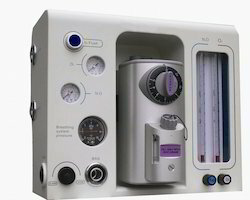 We also offer Anaesthesia Ventilators in variuos configurations . 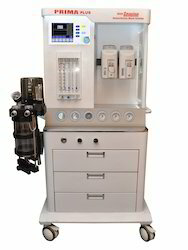 High level, very stable anesthesia ventilator, high level microcomputer control the machine, it can match any different anesthesia machine. Unit simple in operation and easy to maintain. Control of Tidal Volume, Respiration Rate & I: E Ratio. Audible & visible alarms incase of faults. Power 220+ 5% V AC, 50 Hz. Oxygen failure protection device (ofpd) : ofpd works as a true fail-safe system as it allows flow of nitrous only in presence of oxygen at rota meter level and locks the flow of nitrous oxide in the absence of oxygen through its rota meter. Basal Flow : When ofpd is operation as indicated by the audio-visual alarm, a separate pneumatic circuit is activated to deliver a minimum oxygen flow of 200-300ml/min through its rota meter. Alarm: audio-visual alarm is activated if flow of oxygen falls below 1 lpm. Simultaneously it activated a pneumatic circuit to lock the flow of nitrous oxide. 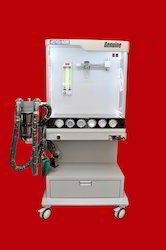 Pneumatic Circuitry: Completely encased, detachable pneumatic circuitry for easy & prompt service check up. Emergency Oxygen: emergency oxygen flush button is provided at table top level on the front it is recessed and guarded to avoid accidental pressing. Vaporizers: the vaporizers of ether and halothane are supplied as standard accessories provision for incorporating vaporizer of user’s choice in the back bar. Drawer: sufficient space provided in an extra-large storage drawer to accommodate all accessories. Instrument Tray : Top tray provided at eye level for keeping monitoring equipments. Patient Circuit: standard magill’s circuit consisting of bag-mount- 01 no. Antistatic corrugated hose-01 no. , heidbrink valve- 01 no. , angle mount -01 no. , catheter mount- 01 no. antistatic face mask-02 nos. (adult & child), 2 ltrs recreating bag-01 no. Optional Accessory: twin-canister circle absorber system with apl valve & y circuit.